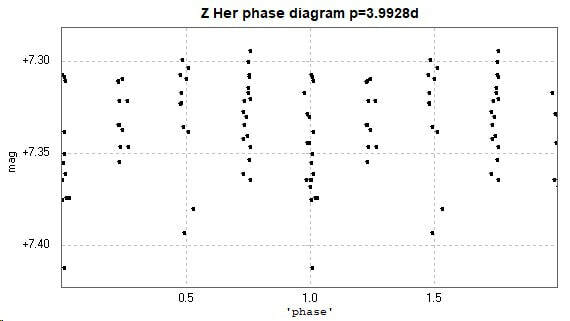 ​Light curve and phase diagram of the EA type eclipsing binary Z Herculis / Z Her. These were constructed from photometry of 60 images taken with the Bradford Robotic Telescope Cluster Camera (BRT) between 2015 April 9 and 2015 November 15 through a tri-colour green filter. Note the aliasing, or 'picket fencing' apparent in the phase diagram. The catalogue period for this star is 3.9928077d (GCVS, AAVSO VSX) and 3.992819d (Kreiner). 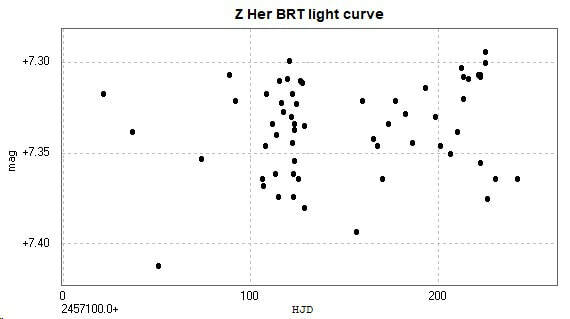 The observing cadence with the BRT tended to be one image per night, often at similar sidereal times. Because the period of this star is almost a whole number of days (4), it was imaged at very similar phases with large gaps in between. After 4 days the images repeatedly fell at very similar phases to the previous images. A much longer observing run, or a different cadence, would have reduced this effect - and possibly detected the minima! [This page updated 2018 December 3].